Sapa is a mountainous area in northern Vietnam, near the border with China. Sapa is located at an altitude of 1650 meters above sea level. 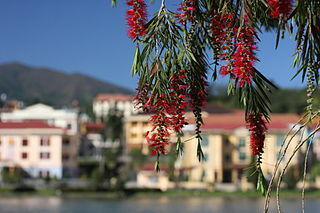 As a tourist destination, Sapa is famous for two things, its rich culture and natural beauty. It is located in the Hoang Lien Son Mountains, which is often referred to as the Alps of Tonkin. Sapa and around a residential area for many indigenous tribes are still traditional. Here, travelers will also be treated to a view of the forest, rice fields, as well as the Fansipan is the highest peak in Vietnam. In November to February, the air temperature is very cold in Sapa, sometimes reaching freezing point. In fact, the presence of snow ever recorded last year. The weather is often change without warning. One day sunny weather with the sun shining, but it rained the next day with heavy hinga more than a day. Travelers on a day like this would be difficult to go around because the conditions are slippery and muddy soil. Not much can be seen in the winter because it looks brown rice and usually a thick fog covered the scenery. Travelers should visit to Sapa in summer where the weather is more friendly. Sapa population consists of ethnic Dao, H’mong, Tay, Kinh, and Giay. There was also ethnically Thai, Muong, Xa Pho, and Hoa. Of the entire ethnic group, which is not only kinh minority. Sapa city’s population around 3300 people, coupled with a group of farmers who live in the surrounding area. Older women in Sapa making traditional cloth and blankets for sale on tourists. They can even speak in english. Many children who help their parents sell various souvenirs such as friendship bracelets, pillow cases, and so on. Sapa minorities marry their children at a very young age, between 15 to 18 years. Because of this, many who at age 20 already has 2 children. Poverty has made many children away from their villages to trade in Sapa town, though with very little results obtained. The best way is to go to Sapa by train from Hanoi. The travel time between Hanoi and Sapa approximately 9 hours. Vietnam Rail operates several cars, but other cars in the train set owned by private parties, among others Ratraco, Tulic, Fansipan, Victoria Hotels, and Friendly. Some cars are better than other cars. You can buy a ticket from a travel agent. For Vietnam Rail carriages, you can buy in Hanoi Station. The cheapest ticket include sleeping cars with hard seats. Travel agents and brokers typically buy tickets for their customers, so it is difficult to obtain. Travelers sometimes pay better class, but in fact will get a lower grade. The best way to avoid this type of fraud is to buy a ticket at the station so you know how much you paid and for which class. If lucky, you can also obtain the least expensive grade. Ticket prices vary dependent class and season. Ticket prices will soar during the holidays. The train stopped at Lao Cai. There were many buses that will take tourists to Sapa. Bus tickets for 50000 Dong, sometimes even up to 40000 Dong negotiable when off-season. The journey from Lao Cai to Sapa applied for one hour with a beautiful view, with a record when it is not foggy day. In the city of Sapa, tourists can walk around the small town. To be able to reach the villages in the vicinity, you can rent a motorbike or jeep.